ANNVILLE, Pa. -- Albright seniors Jamal Hayden and Daniel Sobolewski have been selected as Middle Atlantic Conference Players of the Week the conference office announced on Sunday. 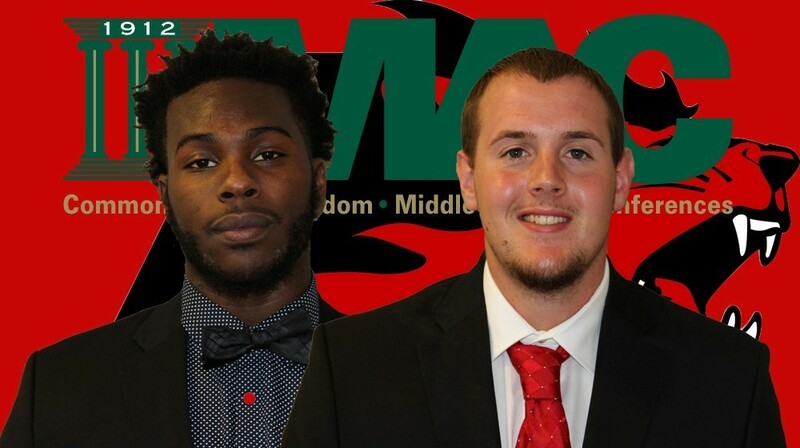 Hayden was named the MAC Defensive Player of the Week, while Sobolewski was named the MAC Special Teams Player of the Week after leading the Lions to a 38-13 victory over Lebanon Valley on Saturday. Hayden led an Albright defense that surrendered just 13 points to a Lebanon Valley offense that entered the game averaging 31.4 points per game. He had a season-high 11 tackles, which included 2.0 sacks and 3.0 tackles for loss. Sobolewski earned his fourth special teams honor as he was a perfect 3-of-3 on his field goal attempts versus the Dutchmen. He connected from 33 yards out in the first quarter and then made kicks of 37 and 19 yards in the third quarter. He also averaged 60.0 yards on eight kickoffs and had three touchbacks. Albright's next game will be on Nov. 21 in the NCAA Division III playoffs. The 32-team bracket will be announced at 6 p.m. today and can be seen on www.NCAA.com.